By Niamh Haskins | October 15, 2014. 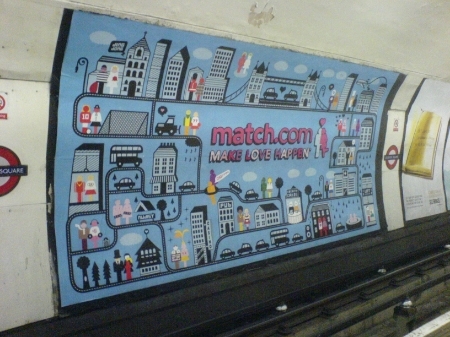 Advertisement for match.com in Leicester Square Tube station, London. Photo: bixentro via Flickr cc. Trolling through several sites on the internet, thumping like to every person you think may be the one, and scanning profiles like nobody’s business, that’s just your average way to find love online. With this fancy modern age we live in there’s thousands of ways to meet people, there’s dating websites like Tinder, OkCupid, match.com just to name a few and even a good auld poke on Facebook might do the job. Over the past few years the number of people using online dating have soared. According to figures from match.com one in four relationships start online, however, it’s a topic that isn’t really spoken about publicly. We see the advertisements on television but never cease to wonder what actually goes on or how it works. Recently in Dublin there has been huge interest into online dating after a woman was allegedly assaulted after meeting up with a guy she matched with online. People who don’t use online dating find themselves asking questions as to why do people use it and how do things like this happen? The thought of online dating may sound daunting for many but Sandra Mason, a friend to the online dating universe, wants to share her story which you can read in full in the next edition of The Liberty, available for free all over The Liberties from Wednesday 22 October.